Ensures the health of the urinary tract and improves the renal excretion. Ingredients: bearberry (Arctostaphylos uva-ursi) extract, lactose monohydrate, methylene blue, talc, magnesium stearate; capsule (titanium dioxide, gelatin). - to improve the renal excretion. 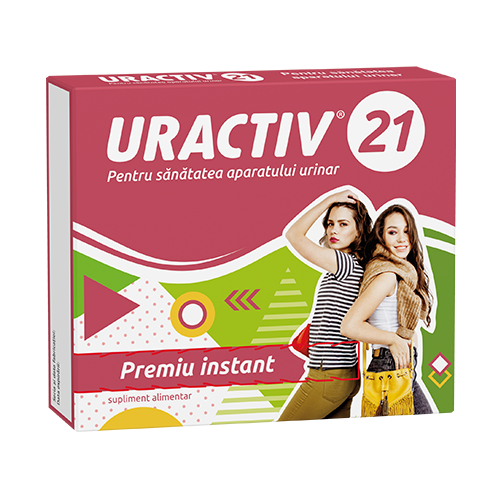 Uractiv® 21capsules is administered from the first signs of discomfort at the level of urinary tract (pain, frequent urination, irritation) until complete resolution of symptoms, but not for more than 14 consequent days. - adults: 2 capsule x 3/day. During administration of Uractiv® 21 capsule, intake of enough amounts of liquid must be ensured. URACTIV capsules may be administered simultaneously with antibiotic therapy. - Uractiv® 21 capsules shouldnâ€™t be administered in patients sensitive to any of the ingredients. - Due to the lack of information regarding the safety of administration during pregnancy and lactation, the use of URACTIV capsules is not recommended during this period. - Uractiv® 21 capsules is contraindicated in irritable bowel syndrome and renal tubular acidosis. - It may interfere with products that determine the increase of urine pH. - Uractiv® 21 capsules should be administered 1 or 2 hours before/after the ingestion of iron based products. - ATTENTION: during the treatment with Uractiv® 21 capsules the urine may be coloured in green or blue, due to the presence of methylene blue and metabolization products of arbutin. Cardboard box containing 1 blister with 21 capsules.